Looking for that perfect place to rest up and enjoy some apres-ski fun after you hit the slopes? With a Powder Beds voucher you can enjoy great discounts on a wide range of accommodation located in top ski resorts around the world. So whether you're an experienced skier or a novice just starting out, make sure you've got somewhere comfortable and classy to cosy up in at the end of the day with Powder Beds voucher codes. Part of one of the UK's most well-established independent tour operators, Osprey Holidays Ltd., Powder Beds draws upon over 40 years' experience in the travel industry to offer their specialised ski accommodation service. Founded and run by real people who love skiing, Powder Beds aims to provide customers with the very best choice of accommodation in some of the world's most popular ski resorts. At Powder Beds, they recognise that skiing can be an expensive hobby – that's why they offer the best priced ski hotels and apartments, with a wide choice so you can pick accommodation to suit any budget. You know you're guaranteed quality accommodation, too, with each property selected by experts who have lived and worked in ski resorts around the world. Planning a skiing holiday with a big group of friends and want to rent a spacious apartment where you can all relax and have fun together after a long day on the slopes? Powder Beds offers a wide range of holiday rental properties in some of the most popular resorts in France, Switzerland, Canada and the USA. Want something cosier and more romantic? The company also offers accommodation at hundreds of luxury hotels around the world, where you can combine real log fires and outdoor hot tubs with access to all your favourite mountain activities. Powder Beds operates a best price guarantee, and if you find the same accommodation cheaper anywhere else they will happily match that price. Need some advice on choosing the right accommodation? You'll enjoy the services of a dedicated sales consultant from the moment you make your first enquiry to the moment you arrive back home at the end of your trip. And in case anything does goes wrong, Powder Beds is fully ABTA bonded – so your booking is fully protected, whatever might happen. Want to escape to the slopes with Powder Beds? With a Powder Beds voucher you can get great deals on fantastic accommodation in all your favourite resorts. So whether it's your first time skiing or you're a seasoned pro, Powder Beds vouchers will help you save the pennies – so you'll have more to spend on fun during your trip! Part of Osprey Holiday Ltd.
apartments and condos at top ski resorts around the world. Browse our website until you find a Powder Beds voucher that's right for you, then navigate to their website to search for accommodation. Enter your desired location and dates and click 'Search accommodation'. Choose a room type and click 'Book now'. Enter your guest details and click 'Proceed to checkout'. Enter your Powder Beds voucher codes where applicable. If you've enjoyed shopping for great deals on ski accommodation with Powder Beds, you might also like to browse discounts on more places to stay at Booking.com or activities with Lastminute.com. Or, if those aren't right for you, you'll find plenty more stores in our Travel section. Navigate to their website to search for accommodation. Enter your Powder Beds voucher where applicable. Enter your billing and payment details and click 'Confirm booking'. Need to contact the team at Powder Beds? Their friendly and efficient UK-based Customer Service crew are always on hand to help. Whether you have a question about your booking, want to know more about what to expect from a Powder Beds adventure or simply want to find out how you could make big savings with Powder Beds vouchers, you can contact them by telephoning 0131 240 3300. Want to find out more about enjoying amazing skiing holidays with Powder Beds? The company maintains a profile across all the major social media networks. Follow them for lots of exclusive content including travel hints and tips, snow updates, competitions and much more. You can also use these pages to find out more about saving money with Powder Beds discount codes. Don’t forget to check them regularly, as you can never be sure when a free Powder Beds voucher might be waiting for you! Buy now online at www.powderbeds.com. When my nephew wanted to go skiing with his friends, my sister was worried about the cost. Luckily, he used a Powder Beds voucher he found online. 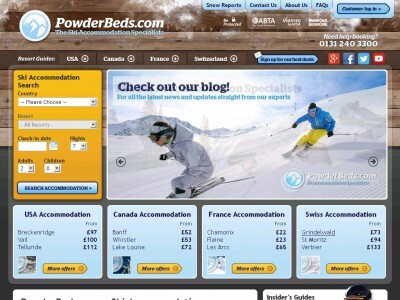 At powderbeds.com they offer a wide range of hotel and self-catering accommodation in top skiing resorts around the world – all available at a discount with Powder Beds voucher codes. He used his Powder Beds vouchers to get a great deal on an apartment in Villars for all of his group. So why not treat yourself to some snow with a Powder Beds discount code?